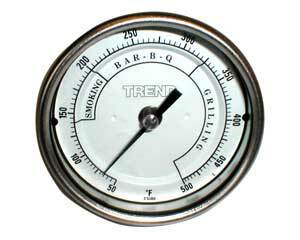 These TREND BBQ Thermometers the same models used in large chemical, pharmaceutical and industrial plants and are made to the same exacting standards. the only difference is a special dial that has the ranges for SMOKING, BAR-B-Q, and GRILLING marked on it. The stem is 1/4" diameter 304 stainless steel, TIG welded at tip and case connection. 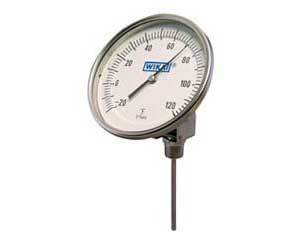 This thermometer offers a large 5" Dial with an adjustable head that can be set at any angle. TO ORDER Price: $89.56 ea plus $9.56 shipping and handling Contiguous United States, please allow 3-4 weeks for delivery. 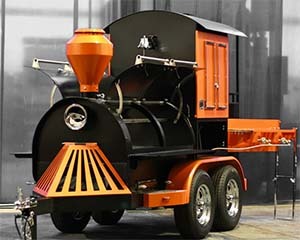 ALL ABOARD the Iron Horse BBQ! 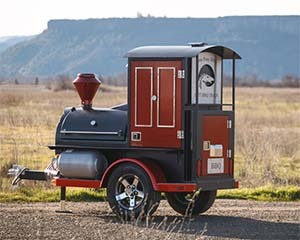 Little BBQ brother to the Iron Horse BBQ Grill, this barbecue is small enough to be towed by most vehicles yet still maintains ample BBQ grilling space.